Description: In article the analysis of opportunities of active protection armored machinery systems from anti-tank arms is carried out. Qualitative schemes of work of separate systems are provided. The comparative analysis of the main characteristics of active protection complexes shows a number of advantages and shortcomings of each of them. Ermakov, G.V., Chenykaev, A.V. and Gogoniants, S.Iu. 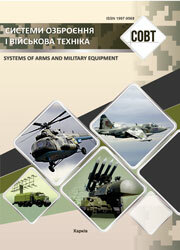 (2013), “Analiz vozmozhnostei primeneniia kompleksov aktivnoi zashchity bronetekhniki” [Analysis of application opportunities of armored machinery active protection complexes], Systems of Arms and Military Equipment, No. 4(36), pp. 21-25.